Adobo is a dish made out of four important ingredients namely the meat (pork or chicken), soy sauce, vinegar and loads of garlic, without one of them it cannot be called an adobo apart from one exception, this adobo sa puti. Basically adobo sa puti is a similar dish sans soy sauce, I am not sure about its origins but my wild guess is that this was created by someone who planned to make adobo and found out there was no soy sauce, instead of buying one to save money he used salt as a replacement. That theory is quite possible because in Philippines not so affluent people are trying hard to make frugal ways of preparing dishes like this, no soy sauce means an extra saving which can buy you some other important things in life. The result is really quite the same as the flavour notes of an adobo dish is very sour and very salty which the replacement can also achieve. Now I had the similar scenario a couple of weeks ago when I was planning to cook my adobo, to my surprise I ran out of soy sauce and remember that this dish existed. The wife is quite sceptical as she never tried had adobo sa puti but the end result had spoken for itself. Season pork belly with salt then set it aside. Deep fry potatoes until golden brown. Remove from pan then set aside. In a separate pot sauté garlic in oil using low heat until golden brown. Remove from pot and set aside. Add pork belly and fry until browning occurs. Add ½ cup water, ½ cup vinegar, 2 tbsp peppercorn, 4 bay leaves and 1 tbsp sugar then bring to a boil and simmer for 25 minutes. Drain any remaining liquid and in a separate frying pan add oil and fry the drained meat in high heat browning the sides. Pour the drained liquid back in the pan together with the deep fried potatoes. Add more vinegar and water if it dries up. Simmer for additional 5 minutes, season with salt if needed then serve. Pork and potatoes always go well together! Would love to try this dish at home but don’t think I have the Filipino style sugar… possible to replace it with brown sugar? 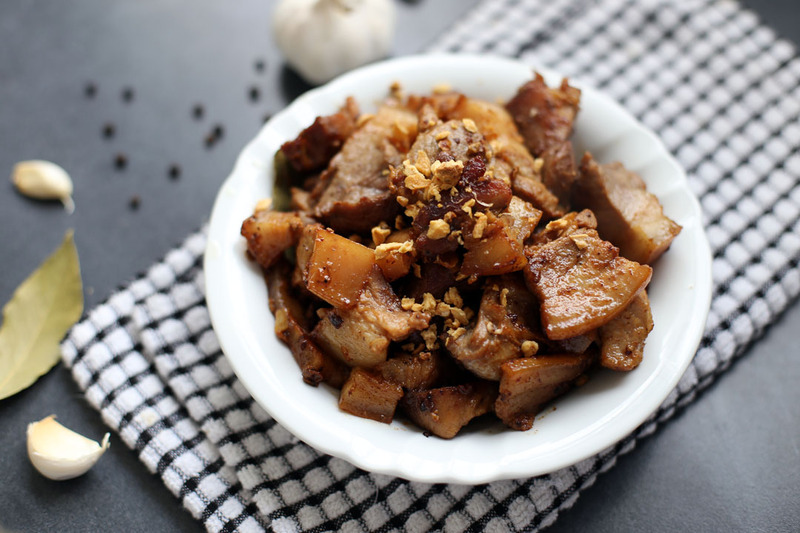 Soy sauce in adobo is a Chinese influence — Chinese traders who visited the Philippine Islands and traded with native Filipinos introduced soy sauce to the islands. The original Filipino adobo used either patis (fish sauce) or sea salt for the salting component. Thanks for sharing this information, it means adobo sa puti might be the original version of the adobo. I’ve heard of adobo, never tried. Looks similar to some of our pork dishes. Bet this tastes really great! In Pampanga, this is the original adobo but with fewer steps. You just boil the pork in garlic, vinegar, salt, pepper and bay leaf. It keeps for a long time, almost like paksiw. Prior to serving, the pork is fried until brown. You can then fry some cold rice in the same kawali. In Rizal, this is called adobong matanda. Hmmmm…no soy sauce. Interesting! I’ve yet to try this…SOON! It looks delish just like the traditional adobo. 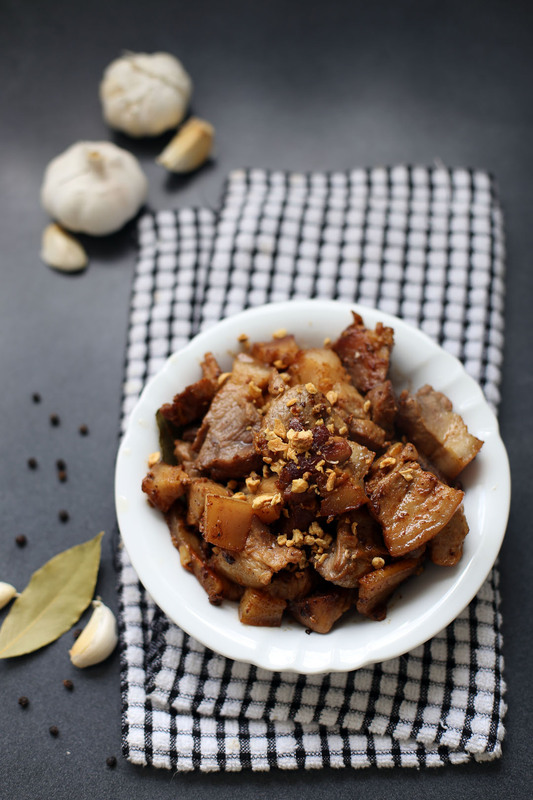 I love Filipino foods… so many dishes with pork belly! Thumbs up!